Why we are not free to say whatever we want?? We do not have freedom of speech. Is everything we say… everything we comment on social media free from being censored and analyzed by other companies? Check below. Please pay close attention to the print screen below. It gives us the example of SkyUK. A company that is client of CrispThinking — a service provider that is engaged in social media mass surveillance. SkyUK, like many other big companies (Disney, BBC, Canada Goose, Lego, etc.) use the services of a Social Media Moderation company called CrispThinking (based in the U.K.) to collect, analyze and moderate whatever you say online. The image you see is CrispThinking’s internal communication system, where they talk and update the moderators about guidelines from their clients. 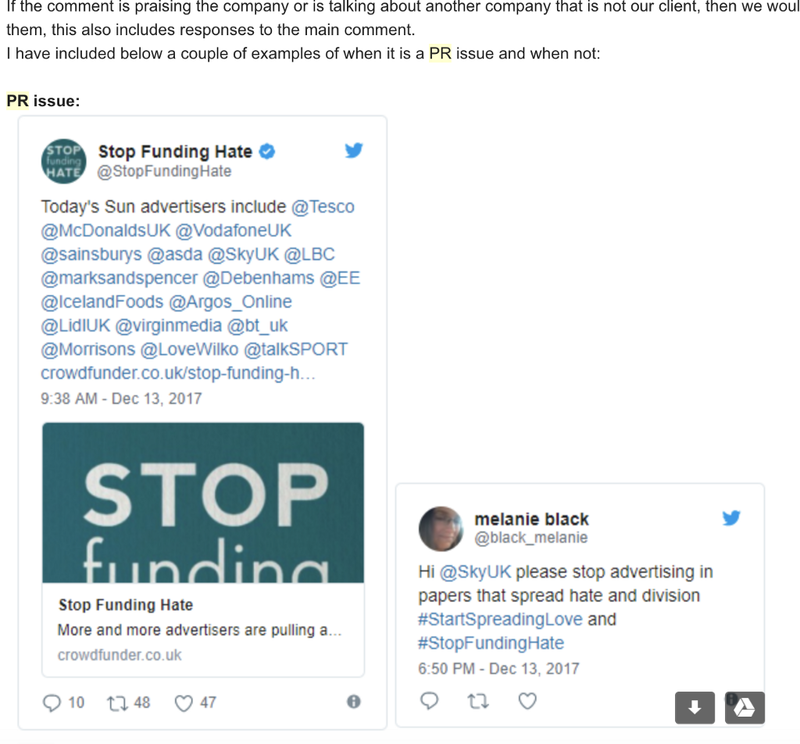 As you see, SkyUK really wants to silence the story accusing them of funding hate. Anything they see that is not positive to their clients may get deleted. What happens when their moderators tag a comment? The comment gets deleted and statistics are sent to the client (Who posted the comment, when, their age, location, where do they work, etc.). This data is then used to create insights about Disney’s audience and sentiment towards the brand. It is also used for many other things (e.g. block you from commenting, profiling, etc.). What happened to our freedom of expression? Why can’t we just say what we want about whatever we want? Why do we have to be subjected to constant monitoring from social media platforms, third-party companies, and even government? But it is not just what you write in their client’s social media pages… It is what you write all over the web. CrispThinking has a platform where every moderator logs in whenever they want. This platform works by collecting all comments, posts you write that have certain specific keywords in them. For example, if you write a Twitter post with the word Disney on it, you can be sure your information will pass through CrispThinking and their army of moderators to see what did you write, whether it is harmful to their clients, your information, and hundreds of other data points about you. It does not matter if you are in Europe, USA, Asia, Antartica, or even Atlantis. They will collect and process your information, and if what you wrote is not good enough, you can be sure it is going to be deleted. The problem we now encounter is trust. We often turn to a brand’s social media page to see what other people are saying about it. If it is generally positive, we most likely will buy their products or services. How can we trust brands when they actively look for and delete the opinion of people that had a bad experience? Inside of your Coca-Cola (another one of CrispThinking’s clients), you find something that should not be there (like this man who found a mouse in his coke bottle). You decide to tweet or post about it on Coca-Cola’s profile. CrispThinking moderation team analyses your post and tags it with: “PR Scandal” — The Post gets deleted. Coca-Cola is advised of this and takes precautions to contain the story from going viral. Canada Goose jackets are often in the middle of PR Crises due to their infamous coyote killing practices. Therefore, CrispThinking services are great in proactively find and delete any bad press they may get on social media. Are you ok with this? Are you ok with being silenced by companies that do not even have the right to collect YOUR personal information? Are you fine with the big guys crushing our opinions? You see… this is not only about Disney, Coca-Cola, Canada Goose, etc. This is about the power that it represents. The power that services like CrispThinking have by being allowed to easily collect your data and do whatever they want with it. This is how elections are manipulated. The excess of power companies that we did not even know that existed have over OUR PERSONAL data, over our opinion, over our voice!